Total drive time with one stop will be about 2.25 hours, so we’ll end up at John Kenner’s place at about 12:25. Please RSVP without fail. Greg Tatarian (1971 S4 DHC) designed the route and will lead the drive. You can email Greg for more info or download PDFs of the flyer and map from his website. We will end our drive at John Kenner’s place: 5190 Vine Hill Road, Sebastopol at about 12:25. John will be serving excellent BBQ’d marinated chicken, potato salad and fresh vegetables from his garden at about 12:30. Bread, desert, and beverages are potluck.If you don’t eat chicken, bring something else. A refrigerator will be available. John will open his rustic Lotus Barn (and Triumphs) for you to look around. This is not quite the scale of the one in Pennsylvania that’s been on Lotuselan.net lately, but it’s different, and fun! PLEASE R.S.V.P. SO JOHN CAN HAVE SUFFICIENT FOOD AVAILABLE! 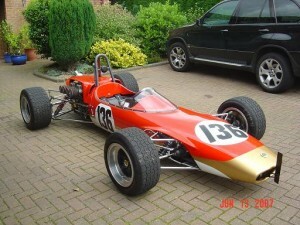 The Fia has confirmed that the Lotus name will officially be returning to Formula 1 for the 2010 season. 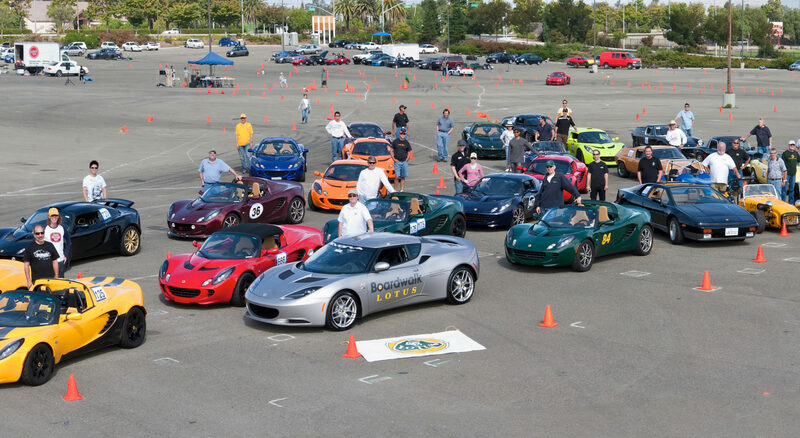 While not currently affiliated with Group Lotus, the team will initially be based out of Norfolk and is backed by Malaysian Government and a consortium of Malaysian entrepreneurs. The team’s future design, R&D, manufacturing and technical centre will be purpose built at Malaysia’s Sepang International Circuit. 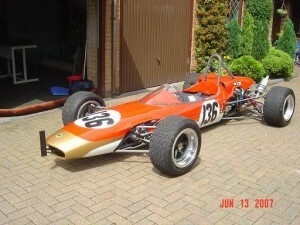 Following an intensive selection and due diligence process, the FIA has awarded the 13th entry in the 2010 FIA Formula One World Championship to the Lotus F1 Team. Nevertheless, the FIA considers that BMW Sauber’s application is of high quality and would constitute a competitive participant in the Championship. As such, it has awarded BMW Sauber the ’14th place’ in the Championship meaning that it will be entitled to fill any vacancy that arises on the 2010 grid. Detailed below is information about the new team that has been confirmed to compete in the Championship from next year. A partnership between the Malaysian Government and a consortium of Malaysian entrepreneurs, 1Malaysia F1 Team returns the Lotus name as a constructor to Formula One for the first time since 1994. 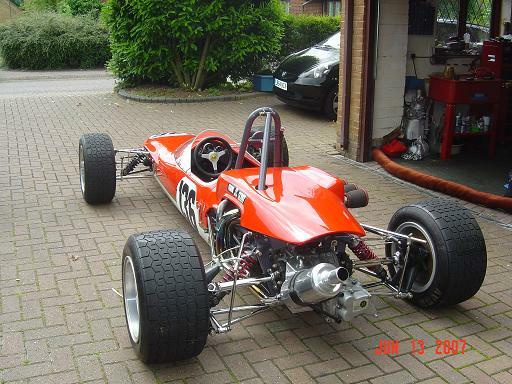 The team will initially be based at the RTN facility in Norfolk, UK, some 10 miles from the Lotus Cars factory. A 50,000 square foot fully equipped facility, RTN was built by Toyota for its initial Formula One programme and then used by Bentley for its successful Le Mans programme. The team’s future design, R&D, manufacturing and technical centre will be purpose built at Malaysia’s Sepang International Circuit. Team Principal Tony Fernandes is the founder and CEO of the Malaysian-based Tune Group, owner of the Air Asia airline. 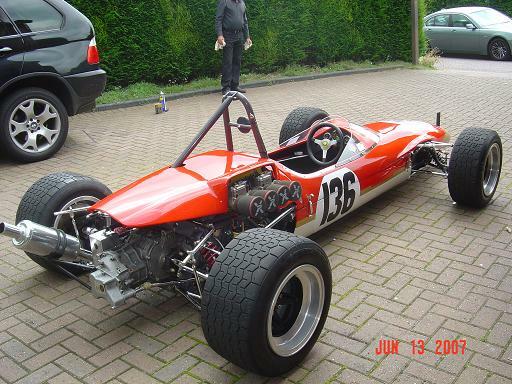 The team’s Technical Director Mike Gascoyne has over 20 years of experience in Formula One having previously performed the same role for the Force India, Toyota, Renault and Jordan Formula One teams. As part of its application to compete in the 2010 FIA Formula One World Championship, the team has agreed an engine supply deal with Cosworth and a wide variety of technical partnerships including Xtrac and FondTech. For the final event Oct 17th, the paper work is signed and we’ll be trying out a new site. The Centennial parking lot at Great America, in Santa Clara. Where the 49er’s hope to be playing in a few years (and right across the street from their HQ and training faculties). Courtesy of our sponsor, Silicon Valley Auto Group, we will have a nice BBQ cooked on site (tri-tip and chicken and garden burger for the veggies) along with all the trimmings, heck we’ll even have chairs and tables so everyone can sit down and enjoy it. Also thanks to SVAG we’ll have the trophies to give out to the season winners. Both Andrew and Jordan will be there. 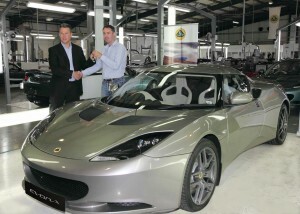 I’ll let Andrew address it the day of but they are planning a unveiling of the Evora shortly. 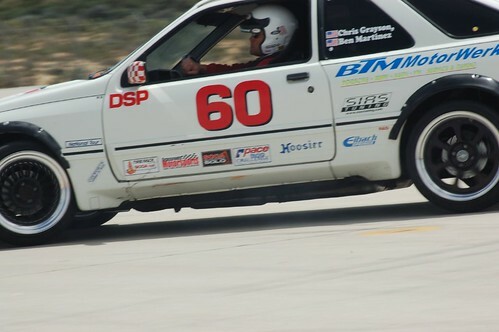 Congratulations to GGLC Club Members Shelly Monfort and Ben Martinez for winning their classes at the 2009 Tire Rack SCCA Solo National Championship. 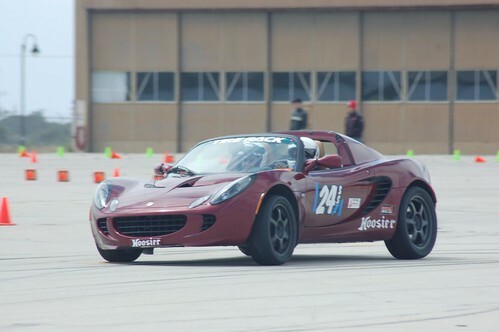 Shelly won her 3rd national championship in the Super Stock Ladies class in her Lotus Elise against heavy Corvette opposition while Ben took the D Street Prepared class in his Merkur XR4 Ti. Additionally club member Jesus Villarreal was the runner-up in C Prepared while autocross series regular Elise Sias finished 3rd in the Street Modified Ladies class. The Lotus Range Extender – designed specifically for the new breed of highly efficient series hybrid vehicles. Lotus Engineering, the world-renowned automotive consultancy division of Lotus, unveils its Range Extender engine at the 63rd Frankfurt International Motor Show. In a series hybrid vehicle, the Range Extender engine is attached to an electricity generator and provides a highly efficient source of energy to power the electric motor directly or charge the vehicles battery. The battery can also power the electric motor which enables the design of a drivetrain that has low emissions, optimised performance and acceptable range. The Lotus Range Extender engine features an innovative architecture comprising an aluminium monoblock construction, integrating the cylinder block, cylinder head and exhaust manifold in one casting. This results in reduced engine mass, assembly costs, package size and improved emissions and engine durability. The three-cylinder 1.2 litre Range Extender engine is optimised between two power generation points, giving 15 kW of electrical power at 1,500 rpm and 35 kW at 3,500 rpm via the integrated electrical generator. Its low mass of 56 kg makes it ideal for the series hybrid drivetrain configurations for which it is designed. 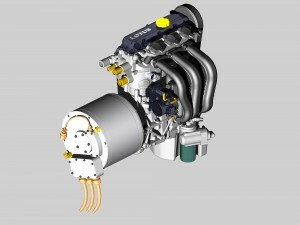 The engine uses an optimised two-valve port-fuel injection combustion system to reduce cost and mass and, in line with Lotus Engineering’s extensive research into renewable fuels, can be operated on alcohol-based fuels or gasoline. The Range Extender features a novel engine architecture incorporating a monoblock construction that blends the cylinder head and block together eliminating the need for a cylinder head gasket, improving durability and reducing weight. Approximately 17 parts are eliminated using this approach and the water jacket is better optimised. Attached to the engine via the crankshaft, the generator sustains vehicle operation beyond the range provided by the batteries. The Lotus Range Extender engine generates a reduction in emissions through faster light-off of the close-coupled catalytic converter with a reduction in heat loss between the exhaust port and catalyst inlet. Engine operating range is optimised to deliver more efficient running, which also aids underhood thermal management. Utilisation of the monoblock construction results in an assembly cost reduction, while there is also a reduced catalyst loading requirement because less heat is lost on engine start-up between the exhaust port and catalyst inlet. Dany T. Bahar has been appointed as the new CEO of Group Lotus effective 1st October 2009, replacing Michael J. Kimberley, who retired in July. 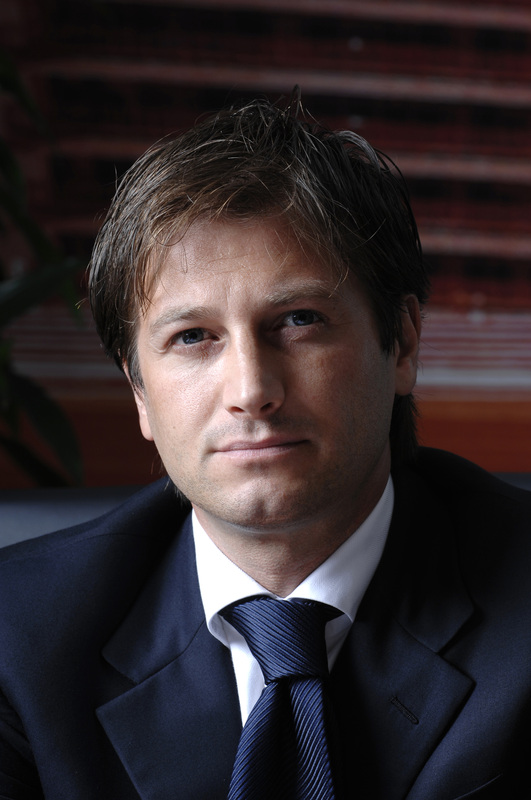 Prior to this appointment, Dany Bahar was Senior Vice President, Commercial & Brand for Ferrari SpA where he was responsible for worldwide road car sales and after sales business, overall road car and F1 marketing activities, licensing, and merchandising business. Before joining Ferrari SpA, Dany Bahar was the Head of Corporate Projects Business in Red Bull GmbH. He was responsible for the overall corporate project business development, with emphasis on diversifying the business such as setting up their F1 strategy with Red Bull Racing and Scuderia Toro Rosso and the US based Nascar Team operations, acquiring football clubs in Salzburg, New York and Ghana for commercial purposes. Dany Bahar, a Swiss National, holds an MBA and is married with two children. Luke Bennett, Director of Lotus Cars (left) hands over the keys of the first customer Lotus Evora to Mr Matthew Melling at the Lotus Headquarters in Norfolk, UK.